In many industries, company rules require professionals working at heights to tie off to a suitable anchor point before they can work with both hands. In some circumstances, these standards are often difficult or even impossible to keep, and often result in operators working in unsafe positions. And sometimes professionals are compelled to use expensive, time-consuming scaffolding systems. 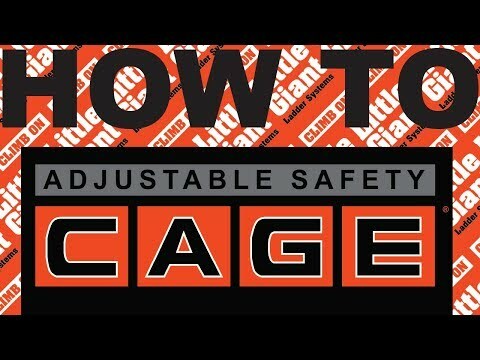 The Little Giant Adjustable Safety Cage™ is a versatile, safe alternative to tying off, and a much faster, much more inexpensive alternative to many scaffolding applications. The Cage is constructed of non-conductive, high-strength fiberglass-resin composite. The Cage is fully adjustable in one-foot increments, allowing the operator to adjust the platform height to the job at hand. Each side adjusts independently, so operators can also use the Cage over uneven surfaces or stairs, where a mechanical lift or ordinary stepladder could never go. And the Cage protects operators in a fully enclosed working platform, allowing them to work safely and quickly with two hands while complying with industry regulations. Time- and energy-saving Tip & Glide™ Wheels make it quick and easy to move from job to job. The Cage is also available with Wheel Lift™ Casters that allow you to easily move the Cage from place to place while fully deployed. The Adjustable Safety Cage is available in 3-5, 5-9, and 8-14-foot sizes. HI, This is Shahrukh raza from, Pakistan, we are TV channel and need a GSA Number: GS-07F-475AA The Adjustable Safety Cage Max 17-foot size. kindly share FOB NewYork prices. we will import that to Pakistan. 3 Easy Steps: Tip it up, pull the bottom section towards you, and lock into place. Weight Capacity 375 lbs. 375 lbs. 375 lbs. 375 lbs. 375 lbs. 375 lbs. 375 lbs. 375 lbs. 375 lbs. Cage Min. Height 6 ft. 8 in. 6 ft. 8 in. 6 ft. 8 in. 8 ft. 8 in. 8 ft. 8 in. 8 ft. 8 in. 11 ft. 8 in. 11 ft. 8 in. 11 ft. 8 in. Cage Max. Height 8 ft. 8 in. 8 ft. 8 in. 8 ft. 8 in. 12 ft. 8 in. 12 ft. 8 in. 12 ft. 8 in. 17 ft. 8 in. 17 ft. 8 in. 17 ft. 8 in. Max. Highest Standing Level (Platform) 4 ft. 11 in. 4 ft. 11 in. 4 ft. 11 in. 8 ft. 8 in. 8 ft. 8 in. 8 ft. 8 in. 13 ft. 4 in. 13 ft. 4 in. 13 ft. 4 in. Platform to Guardrail Height 3 ft. 8 in. 3 ft. 8 in. 3 ft. 8 in. 3 ft. 8 in. 3 ft. 8 in. 3 ft. 8 in. 3 ft. 8 in. 3 ft. 8 in. 3 ft. 8 in. Platform Area 18 in. x 22 in. 18 in. x 22 in. 18 in. x 22 in. 18 in. x 22 in. 18 in. x 22 in. 18 in. x 22 in. 18 in. x 22 in. 18 in. x 22 in. 18 in. x 22 in. Outer: 1.75 in. Inner: 1.5 in. Outer: 1.75 in. Inner: 1.5 in. Outer: 1.75 in. Inner: 1.5 in. Outer: 1.75 in. Inner: 1.5 in. Outer: 1.75 in. Inner: 1.5 in. Outer: 1.75 in. Rung Size Double Section 4 in. 4 in. 4 in. 4 in. 4 in. 4 in. 4 in. 4 in. 4 in. Storage Height 7 ft. 10 in. 7 ft. 10 in. 7 ft. 10 in. 9 ft. 8 in. 9 ft. 8 in. 9 ft. 8 in. 12 ft. 8 in. 12 ft. 8 in. 12 ft. 8 in. Storage Width at Base 3 ft. 10 in. 3 ft. 10 in. 3 ft. 10 in. 3 ft. 10 in. 3 ft. 10 in. 3 ft. 10 in. 3 ft. 10 in. 3 ft. 10 in. 3 ft. 10 in. Storage Depth 17 in. 11 in. 11 in. 11 in. 11 in. 11 in. 16.5 in. 16.5 in. 16.5 in. Max. Footprint 3 ft. 9.5 in. x 5 ft. 11 in. 3 ft. 9.5 in. x 5 ft. 11 in. 3 ft. 9.5 in. x 5 ft. 11 in. 3 ft. 9.5 in. x 7 ft. 4 in. 3 ft. 9.5 in. x 7 ft. 4 in. 3 ft. 9.5 in. x 7 ft. 4 in. 3 ft. 9.5 in. x 10 ft. 8 in. 3 ft. 9.5 in. x 10 ft. 8 in. 3 ft. 9.5 in. x 10 ft. 8 in. Cage Weight 102 lbs. 107 lbs. 105 lbs. 129 lbs. 133 lbs. 130 lbs. 151 lbs. 156 lbs. 153 lbs.